Frederic Remington (1861-1909) was born October 1st 1861 in Canton, New York. Remington is first considered as an illustrator but his bronze sculptures are very powerful and extremely well done. He attended the Yale Art School as one of the first two students ever enrolled in that institution but through out his life he considered himself to be primarily a self taught artist. The death of his father in 1880 left Frederic Remington with a small income which allowed him to travel in the American West. During his travels he worked as a hired cowboy and a sheep rancher, traveling all over the plains, and he even prospected for gold. Wherever Remington went he sketched everything around him, recording the last of the Old West on paper. When he returned to New York in 1885, virtually broke with only three dollars remaining, he had with him hundreds of drawings from his 4 years of travel. Dissatisfied with his drawing abilities he enrolled in the Art Students League to improve his technique. Harpers Weekly purchased Remington's The Apache War - Indian Scouts on Geronimo's Trail drawing for the cover of their January 9, 1886 issue. This was the first illustration published under the name of Frederic Remington and was to start the career of America's foremost artist. Theodore Roosevelt asked Remington to illustrate his book Ranch Life and the Hunting Trails in 1888. Remington was first exposed to sculpture in 1895 when he met Frederic Ruckstull who, at that time, was working on a monument for the Pennsylvania State House. 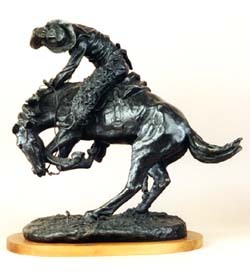 This chance meeting led Remington to do his first sculpture titled The Bronco Buster that same year. 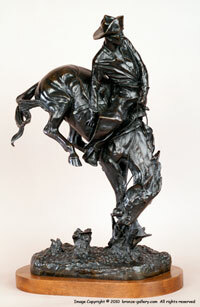 Remington was to produce twenty-five different sculpture models in his career. Up until 1901 Remington used the Henry Bonnard foundry in New York for all of his casting work and these early bronzes were all done by the sand cast method of production. After 1901 Remington switched foundries and started to use the lost wax casting method of foundry production with the Roman Bronze Works foundry of New York. Remington was the first American sculptor to use this casting method which dated back to early Roman times and allowed the artist to have total control over each cast as each cast was made from a new wax model created by the sculptor. This allowed Remington to change his sculptures at every casting if he wanted to and he did just that, changing the rise of a horses hoof or the positioning of a tail or rider. Remington produced only one monument in his short life and that is The Cowboy which stands in Fairmount Park in Philadelphia. Frederic Remington was to die unexpectedly of appendicitis on December 26th 1909, cutting short a life that should have produced many more masterpieces. His widow when she died in 1918 left all of his art to the Remington Art Museum in Ogdensberg, New York and specified that all of his bronze casting molds and models be broken and destroyed so that no one could continue to produce his bronzes.